This GoPro Hero 3 USB Camera Cable is used to connect the GoPro Hero 3 direct to the Immersion RC or Fat Shark video transmitters. 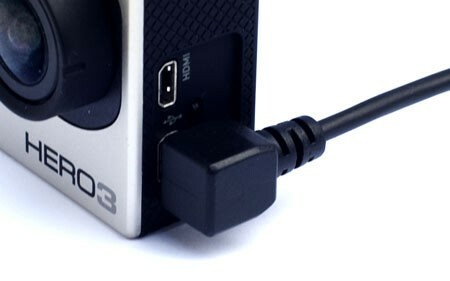 The cable plug for the GoPro is a 90 degree USB plug to give the lowest profile when plugged in, the connector for the video and audio to the transmitter connector is straight. The video and audio channels from the GoPro 3 Hero are connected when using this cable. The GoPro Hero 3 USB Camera Cable is 30 cm long and is flexible enough to allow free movement of camera gimbals when in operation. 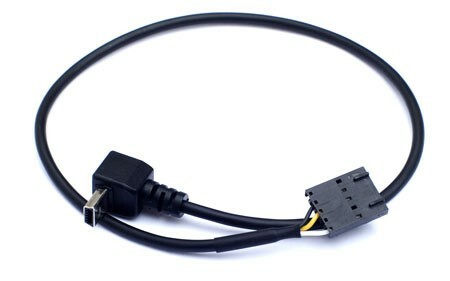 Please note that this cable is Not compatible with the HERO and HERO2 cameras. I have recently used this cable on my Hero4 Silver and it works well, the only down side is that it won't fit inside the case. As I have the camera mount and case fitted I drilled a hole in the case and trimmed some plastic of the plug and it works a treat.